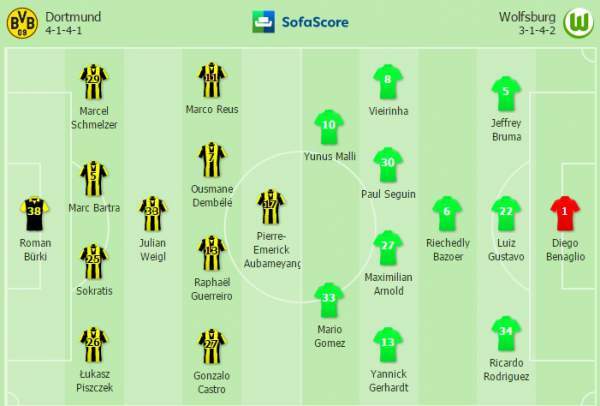 Borussia Dortmund vs Wolfsburg Live Streaming Bundesliga 2017 Score: It is the 21st matchday of the Bundesliga, and today we have Borussia Dortmund hosting Wolfsburg for the game. Dortmund is currently fourth on the table with 34 points from 20 matches, seven points below Frankfurt and above on goal difference from Hoffenheim. On the other hand, we have Wolfsburg who are currently 14th in the table with 22 points from 20 games, two points below Augsburg and three points above Hamburger. 18th February 2017 at 20:00 (IST). Signal Iduna Park, Dortmund, Germany. Dortmund hasn’t been their best in the league right now as they are currently fourth on the points table with nine victories, seven draws, and four losses, scoring 40 goals and conceding 23 goals in total. Pierre-Emerick Aubameyang is their current top scorer in league with 17 goals to his name. They played against Benfica in their Round of 16 ties and lost the game by 1-0 away from home as Mitroglou scored the only goal of the match. Borussia has won two games, drew two and lost one out of the last five games played in the league. They played against Darmstadt in their last game in the league and lost the game by 2-1. Wolfsburg is currently #14 on the Bundesliga points table with six wins, four draws, and 10 losses, scoring 19 goals and conceding 28. They have won three games and lost two out of the last five matches played in the league. Mario Gomez and Yunus Malli both have six goals each in the league for Wolfsburg. Wolfsburg played against Hoffenheim in their previous game in the league and won the game by 2-1. Maximillian Arnold and Didavi scored for the home team, and Zuber scored for Hoffenheim. Burki, Sokratis, Burnic, Ginter, Weigl, Pulisic, Guerreiro, Durm, Mor, Aubameyang, Reus. Benaglio, Gustavo, Rodriguez, Knoche, Gerhardt, Arnold, Bazoer, Seguin, Vierinha, Malli, Gomez. Dortmund is desperate for a win and will try their best to win the game.